Kudditji Kngwarreye was born around 1928 in Utopia, a community in the Eastern Desert about 230 km northeast of Alice Springs. He is one of the elders of the Anmatyerre language group and an important custodian of many important Dreamings. Kudditji is one of the first established male artists from Utopia. Kudditji began painting his Emu Dreamings in a precise ‘dot painting’ style. Later he switched to the more abstract My Country style, consisting of coarse blocks with saturated colors in different tones. The My Country paintings can be seen as a representation of Kudditji’s birthplace, whose land and sky throughout changes of day and season are conveyed in shape and color. Kudditji’s more abstract My Country style is reminiscent of the later work of his famous kinswoman Emily Kame. It is not sure who first started painting in this style. Ever since Kudditji began to exhibit his abstract work in 2003, his star steadily rises in the international art world. 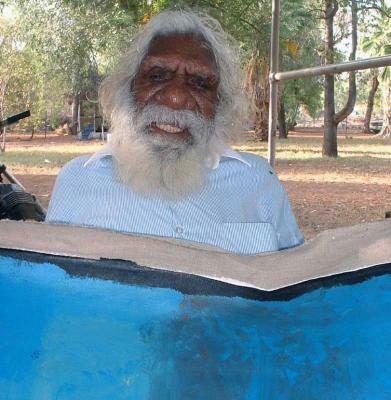 Due to his deteriorating health, Kudditji was forced to stay and paint in one place (Alice Springs), in the last few years he hardly created new works. Kudditji Kngwarreye passed away in January 2017.